The private view of my exhibition of 48 engravings was a great success but there was no time to reflect as the next day saw us heading down to Essex to a family wedding. One extra pleasure was staying at the bed and breakfast establishment of printmaker Akiko Fujikawa. She is a friend of Nana Shiomi - they had both been at Art In Action with me in 2007 - and also gives courses in hanga printmaking. Returning from the wedding, I had just two days to collect everything together and head over to Oxfordshire again and, on the wednesday, everything was packed into the car and I set off. The tent catered for both drawing and printmaking. I could look across and see the Rochat etching press that was used for demonstrations. Over to my side was the lovely 1876 Albion press. Next to it you can see the remarkable linocuts of Colin Moore. Other printmakers attending were Barbara Jackson (etching), Laurie Rudling (collagraph and etching), Melvyn Petterson (etching), Johanna Zhang (drypoint), Louise Hayward (engraving on plastic) and Carry Ackroyd (screenprint). We made a very varied and lively crew. Art In Action ran for four days and it was very busy for almost all of the time. I only really sw anything outside our section if I went out at lunchtime, when it was lovely to meet up with old friends. There is also a large market place of artist, craftworkers and sellers of materials. I treated myself to a selection of superb hand made oil paints by Michael Harding. On the Saturday evening, there is a dinner for the demonstrators. It is a real occasion, starting with a drink and performances in the outside theatre. We then went into the marquee and were served lovely food. Wine flowed and the printmakers had a very happy time. Afterwards, we wended our way home between illuminated tents. It was alovely evening and we only had one more day to go. Back home, I was very tired for a few days. It was a treat to unpack and try out my new Michael Harding paints - and three handmade brushes by Rosemary & Co.
My exhibition has been hung. It was fairly straightforward, especially since I had made a plan of where all the work would go. I made a scale drawing of the available walls and cut out shapes - also to scale - to represent the work. It all went swimmingly. As usual, some changes were made on the day but I was very pleased with the result. In the end I hung 48 engravings - my largest show ever. In the last photograph, you can see that the exhibition continues out into the entrance hall beyond. See you at the opening? I have just about finished framing my forthcoming exhibition. 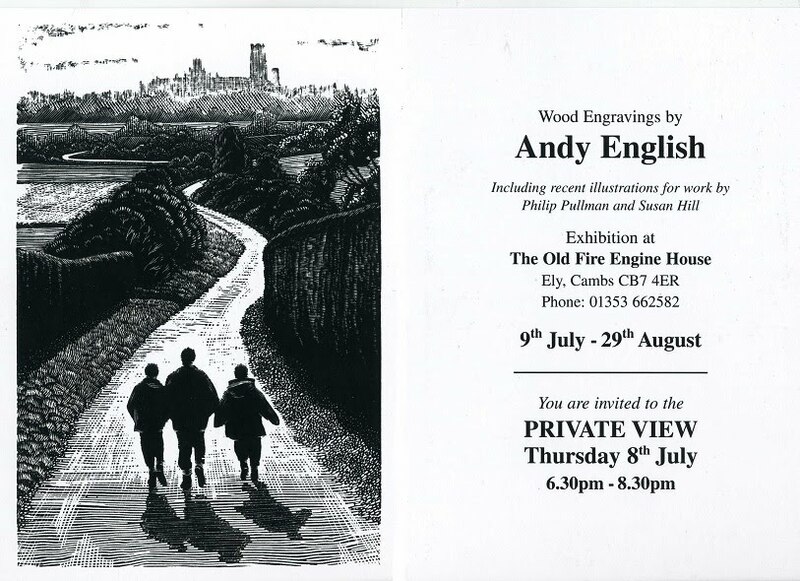 If you are within reach of Ely, Cambridgeshire between 9th July and 29th August, do please drop in and see for yourself. How do you find the gallery? Here is a link to a Google Map. Otherwise, go to the West door of the cathedral (beneath the tower) and walk away across the green beyond the cannon. You will come to a small car parking area and the gallery is clearly signed on your right.